Behold the Emperor! The dragon of the sea who… wait the dragon of the sea? Is that a thing now? Has that always been a thing? Ah, I dunno, let’s go in with the review. Emperor of the Sea was created in 2017. Hey you, at the back! Stop laughing! I’m being serious here! 2017, that’s right! What do you mean the graphics look at least 15 years old? Sorry for that interruption, but the man at the back does have a point. 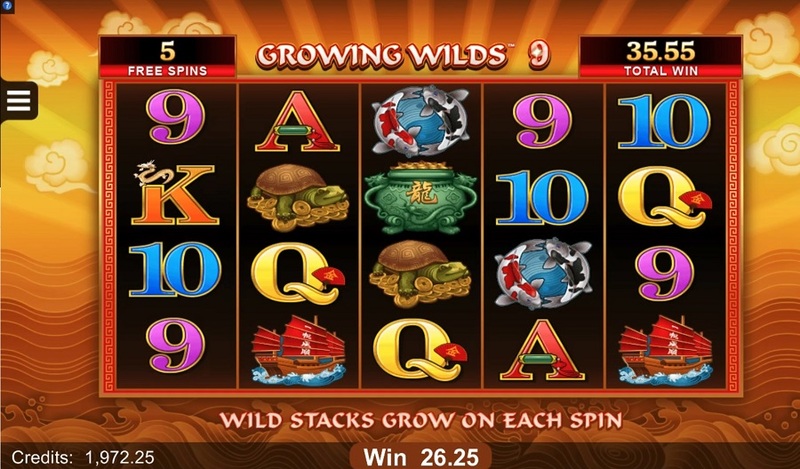 To say this slot is so new and so fresh, it doesn’t half look like something that’s from a by-gone era. The graphics are tired, the animations and transitions are laboured and the whole look and feel of the game just feels really, really dated. Though having said all that, the bonus round is rather good! 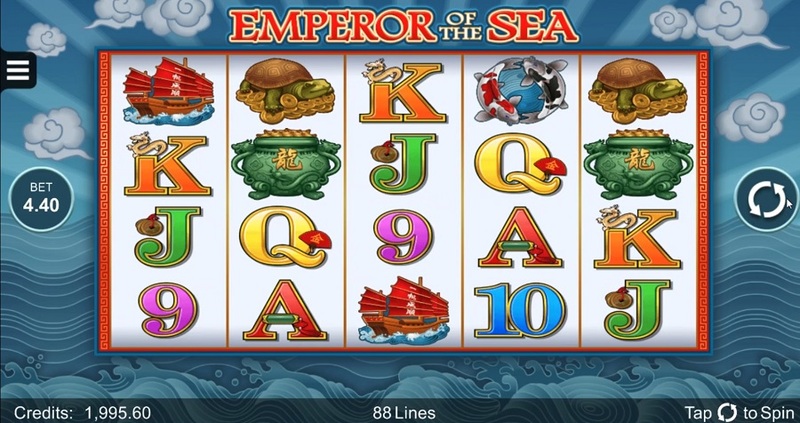 On Emperor of the Sea there are thirteen different symbols including an Emperor of the Sea image, a dragon, a pot of gold, a turtle, koi fish, a boat, plus the usual scatters, and traditional A’s, K’s, Q’s, J’s, 10’s and 9’s. The best paying symbol is, of course, the Emperor of the Sea image which pays out 525/1 if you hit five in a row. 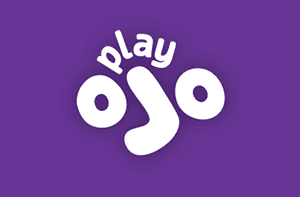 The bonus round is triggered by hitting three scatters on any of the four lines. 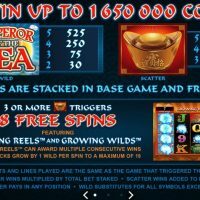 You are then given free spins which are used in a cool game where the opportunities to win grow and grow with every spin. 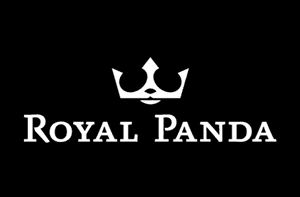 Just watch our video at the top of the page to see how much you can win! 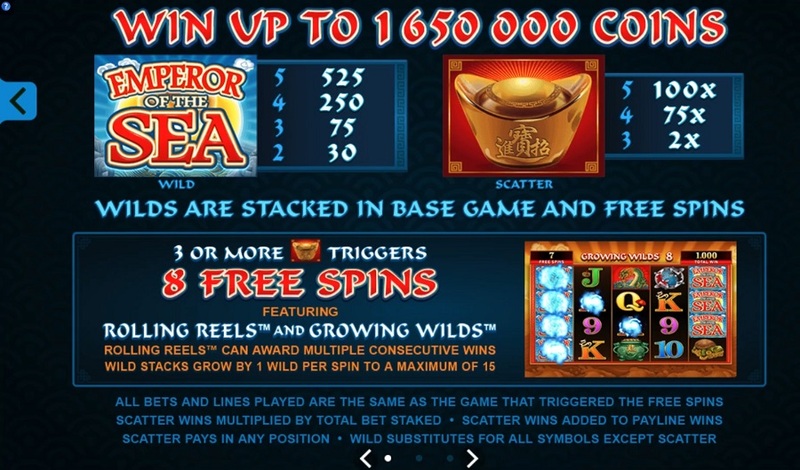 You can’t bet on different lines on Emperor of the Sea and the betting options only range from to 88p to £8.80. The house edge is 3.72%. There is no autoplay feature, which is slightly odd for a game created in 2017. Emperor of the Sea is one of those games you need to ‘sea’ to believe – and not in a good way. 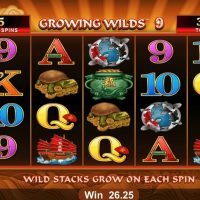 For a slot that was only introduced into the wide ocean of casino games in 2017, it doesn’t half look dated. 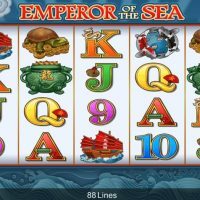 With stale, flat, 2D graphics and clunky transitions, you almost feel a little bit cheated by Emperor of the Sea. You just expect more from it, at least aesthetically.